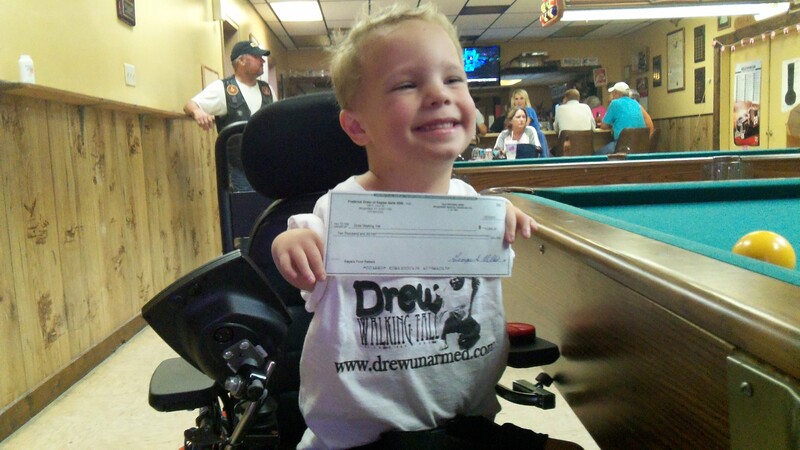 A Million Pennies for Drew! Never again can I say that I’ve never accepted a $10,000 check thanks to The Eagles Club, WMSK, and the Union County Public Schools! We were invited to the Eagles Club to accept the $10,000 that they all raised by penny (and higher denominations) donators at local businesses and through the public schools. We brought along Drew so everybody can see who it is they are fighting for, but Drew was quickly captivated by the pool tables, as most men are when they enter a bar. 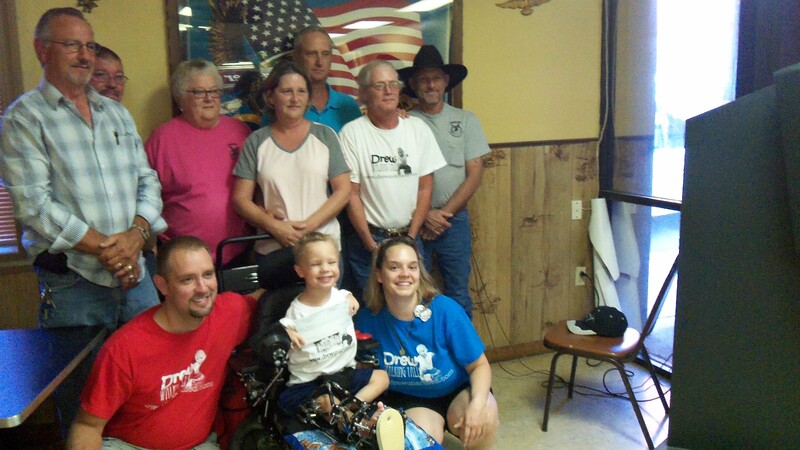 Though Drew invented his own pool game which involved racing balls down the table with Mama and Daddy. We didn’t stay too long though. Shortly thereafter, we returned home and I had no choice but to unpack my clothes that have been sitting folded in their boxes as they have been since we arrived home over a week ago. Sigh. I got through about 10 shirts before I started contemplating leaving all of my clothes here next time and just shopping for a new wardrobe at Goodwill when we get to Florida. Bonus: just donate it back to Goodwill before our return home to Kentucky! Hmmm…I may give this idea some additional consideration. However, Drew has been very laid back since we’ve returned from Florida. He has the most interesting things to say, he plays quietly at times when I need to take care of something in another room, and he’s just so grown up now. I sometimes find myself staring at an old pictures of Drew in his younger years missing him when he was too small to do things for himself. Back when he fit in my arms. With his baby fat and unintelligible speak. Even though at times I had been cooped up too long in a small room with him, unable to even shower in peace, unable to break away for even a moment for some fresh air. But now, I can leave the room, get some peace when needed, and sometimes even work while he contently plays with his Batman helicopter, wrestlers, and other toys. But, I can’t stay away too long. Not that he calls me back, but it’s so fascinating watching him play his game of pretend with his toys. He has these elaborate scenarios and it just boggles my mind that he went from a newborn baby with a “clean slate” to this intelligent and clever 4-year old and I often can’t really point out a single thing that is the source of Drew’s knowledge. He uses words that I don’t think I or Nate have used enough to transfer that knowledge to Drew, but Drew has said in response to my asking him if his toy corn was hot enough, “Actually, it’s not hot enough yet.” I mean, “actually”? He literally had to have heard one of us say that and just knew what it meant. We didn’t hold a flashcard up to him, provide a definition, consciously teach the word to Drew. He heard us say it in passing and without a single thought as to who was listening and knew what it meant. This is so fascinating to me. He knows so many things that Nathan and I don’t give a second thought to knowing ourselves and it’s such an insignificant part of our daily routine that we can’t even recall discussing this subject, or using this word, or presenting this knowledge to Drew. But Drew listens. And, as much as I miss having him on my hip, I enjoy this new Drew more than words can say.